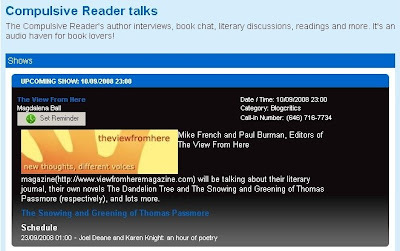 Listen on the 10th Sept at 11.00 pm BST as Magdalena Ball from The Compulsive Reader interviews Paul and I live on Blogtalkradio about The View From Here and Paul's debut book, The Snowing & Greening of Thomas Passmore. Click here to set a reminder and to hear the show. It will be late at night for me and first thing in the morning for Paul in Australia so it will be interesting to see how we both get on at opposite ends of the day! I'm a bit of a late night girl so I'll be tuning in! Now how about a dare? Just for a laugh?? Mike can you get the word "Antidisestablishmentarianism"in? (Umm...Hang on is that a word?? It's not in my on-line dictionary!) Well you're the brain box, so if doesn't exist you'd better use the words "Big Ears." Paul, please use the words "Noddy" and "AK47" Ho, ho. Paul, shall we rise to the challenge? You could have the Thomas the Tank Engine book if I can have the Galaxy bar. I can identify with a lot of how he feels about England, the connection with history and prehistory still holding despite the overbuilding and overcrowding, and knowing that you have something to do with it somehow. ALthough I agree with Kate that Tom is too hard on Britain - but maybe that has to be the stance of someone who has emigrated? And the effect of a person's own past on their character and behaviour, and how they choose to let it affect them, or not. And it almost came as a physical shock when Tom makes a crucial decision on the basis of what it would do to someone else if he followed his instinct (again trying not to give away plot) because I have been watching someone do just that. (Their outcome being quite different however). I think your prose is evocative and your dialogue is spot on. And the "dream" sequences are both funny and disturbing. It's the best thing I've read for ages. Original and well crafted first novel. Now what? A signed edition of Thomas the Tank Engine sounds like a threat when Jane is offering it. Her feelings about Thomas are well documented, and enough to not only make the Rev Awdry turn in his grave, I suspect, but to invoke the full wrath of the Fat Controller and the established church. I could probably prattle on about antidisestablishmentarianism for a few minutes, having been required to do so in the past, but things might get nasty if Noddy gets into the same sentence as an AK47 again. Do we really want another massacre in Toy Town? Maybe we do. Will have to wait and see, I guess. Mrs A. I am so delighted that you not only 'got it' but enjoyed it. Thank you. And on the Euston--Birmingham line too! Now, that's whacky. I like to see him as a flawed character in many respects---always more interesting than narrators who get everything right, I believe---and his occasionally uncompromising attitude to Britain is certainly a part of that. That the prose worked in the way you say is important to me. Achieving a lyrical quality that drew the reader in and through the story was something I particularly enjoyed playing with. Where to next? Well, Number Two will be completely different, I hope, but will still be quirky and lyrical in its own way. It's due for release in the second half of 2009. Well, I thought that interview went very well indeed. But you know I thought you kinda cheated boys... you're supposed to drop the words in casually... but I'm a generous girl so send me your details and I'll send the prizes! I blew it! There was a fair amount of echo on the line, so I missed the reference at first. You're right, Jane, a degree of subtlety was required and so I think I have to concede defeat. There was some echo but back here in the UK it was mainly on Magadelena's line. Your voice was quite feint in comparasion to Mike's but I rectified this by just turning the volume up! A nice voice you have PB - which did justice to your extract. So what you're saying is you don't want a personalized copy of Thomas the Tank Engine eh? Disgraceful! Don't get me wrong, Mrs T, I would love a personalised copy of Thomas the Tank Engine & Friends, but would hate to take it on false pretences. After a lifetime of cheating to win what I want, it seems I'm developing a conscience. Ouch. Hmm. Personalised? Does this means that you tied a copy to the train tracks and waited for the 15:17 Paddington to Swansea to make its mark? Next time you will have to be more careful where you discuss secret ops with us! And Jane you did get a mention! Now then Paul can through his prize away, but I want that Galaxy bar! So you cheat at cards eh PB?? Uh-huh. And what else? Scrabble? Trivial Pursuit? Do you sit at night swotting over the answers just so you don't lose?? My goodness, the depths you published authors will sink to! No, it wasn't necessary for me to strap the book to the rail tracks; Mrs T has more subtle methods involving glue, wax crayons, scissors and, appropiately... toliet roll. Well that phrase is certainly more subtle...and such poetic, spiritual overtones. A psalm or a poem to Noddy perhaps?? How delightful, the very idea is deserving of a bar of chocolate...I feel quite inspired! Tiddlywinks and marbles, Jane. These are my specialities.